FEBRUARY 2007 -- Now the holidays are over; we can start thinking about the different contests for the day of celebration on August the 25th. One of them is the craft contest, where you can create something that is chair related or music. For example: a chair planter, a pincushion shape as a chair, a macrame chair, a painted chair, or a picture of a chair. Or if you want you can create a Christmas ornament, note-shaped bookends, a music box, wall hangings, a wreath, or a madris grande centerpiece. You can enter as often as you like; but be sure your name and grange is tape or pinned to your entry. 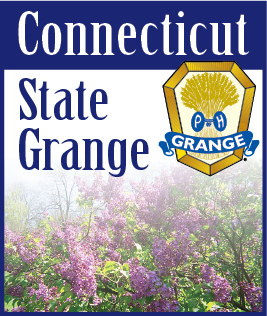 The contest is open to all Grangers, plus children and grandchildren. Entries must be in by 10:30 AM at Goodwill Grange Hall on August 25th for judging. Items will not be return,they will go to the Big E to be sold or use as gifts at state session. Children’s items will be return to them unless they are winners. Then the items will be on display at state session.